Tokyo stocks fell 2.85 percent in the morning session of Thursday, with the Nikkei index briefly down over 800 points, as investors locked in some of Wednesday\'s massive gains. 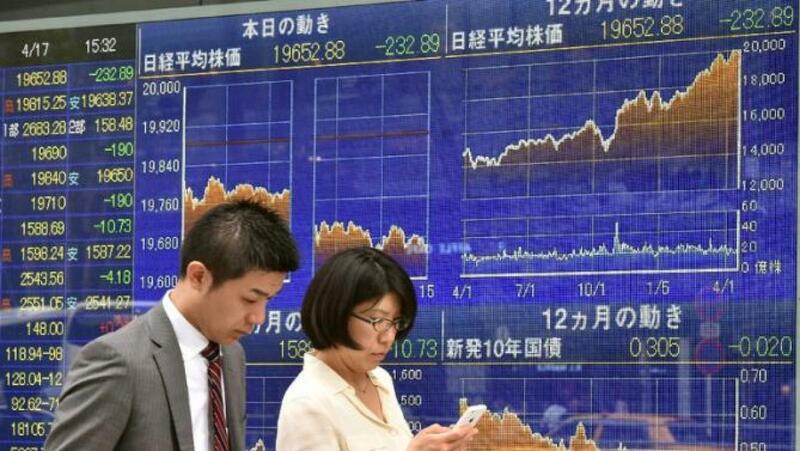 Tokyo stocks fell 2.85 percent in the morning session of Thursday, with the Nikkei index briefly down over 800 points, as investors locked in some of Wednesday's massive gains. The 225-issue Nikkei Stock Average plunged 535.84 points, from Wednesday to end the morning at 18,234.67, Xinhua news agency reported. The broader Topix index of all First Section issues on the Tokyo Stock Exchange was down 31.41 points, or 2.08 percent, at 1,475.96. Every industry category on the main section lost ground except shipping, with mining, oil and coal products and insurance issues leading decliners.